I don’t know about you, but I’m fascinated with any type of animal, especially monkeys! So, anytime that I have a chance to see them in the wild, I take it. On our last road trip through Japan, we rented a car and drove over a good portion of the island of Honshu taking in some quirky sights, eating kobe beef, and even making Cup O’ Noodle noodles. 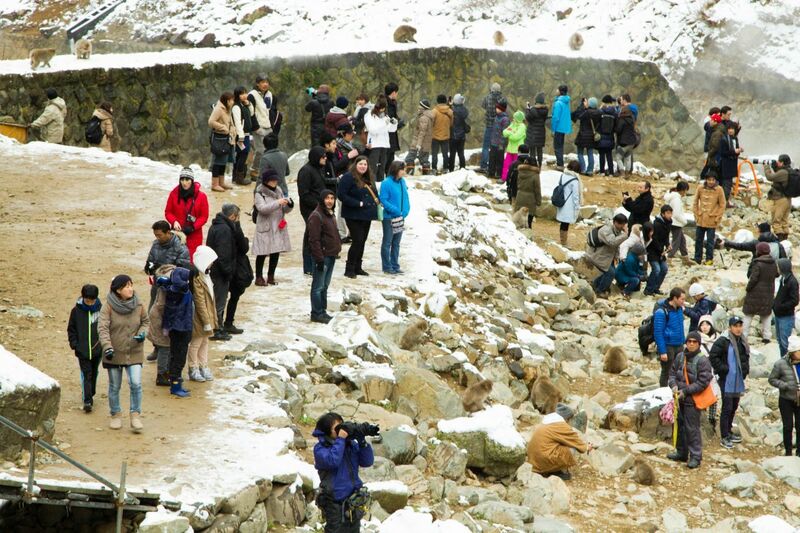 It certainly wasn’t out of the question to visit the bathing snow monkeys and we added to the itinerary. 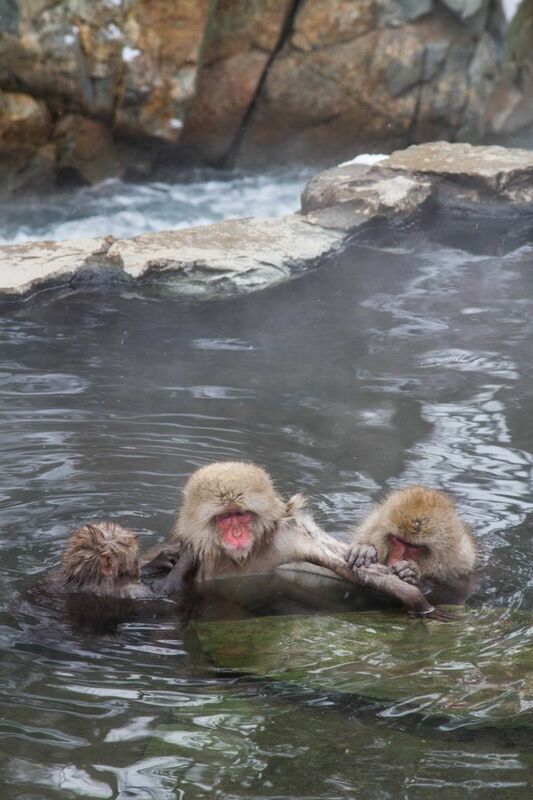 Seriously, snow monkeys in hot tubs! That’s a sight everyone needs to see. 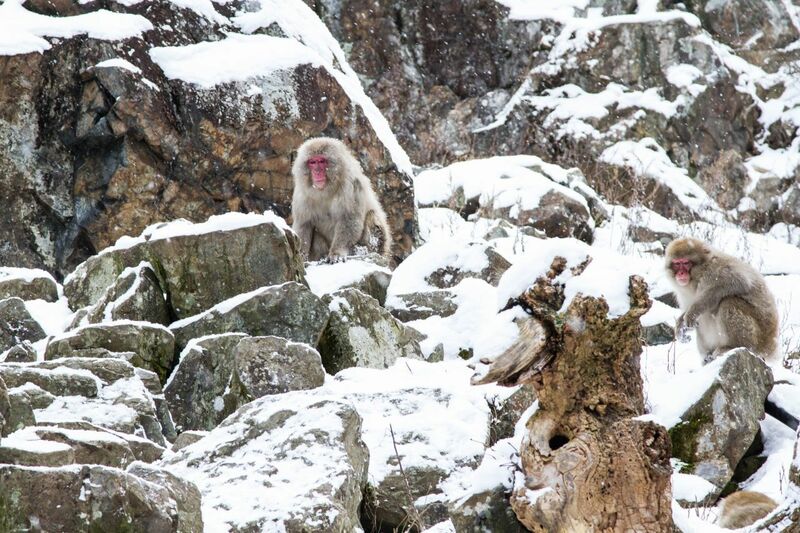 Have you visited the snow monkeys? Any tips you want to share? 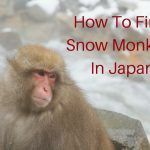 Pin Snow Monkeys for later! 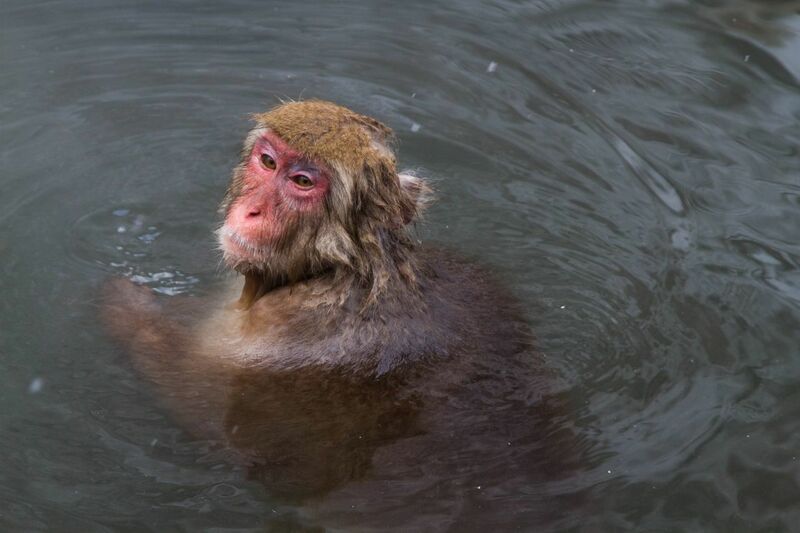 Small family groups of Snow Monkeys will spend hours in the tub, until chased out by a larger male. 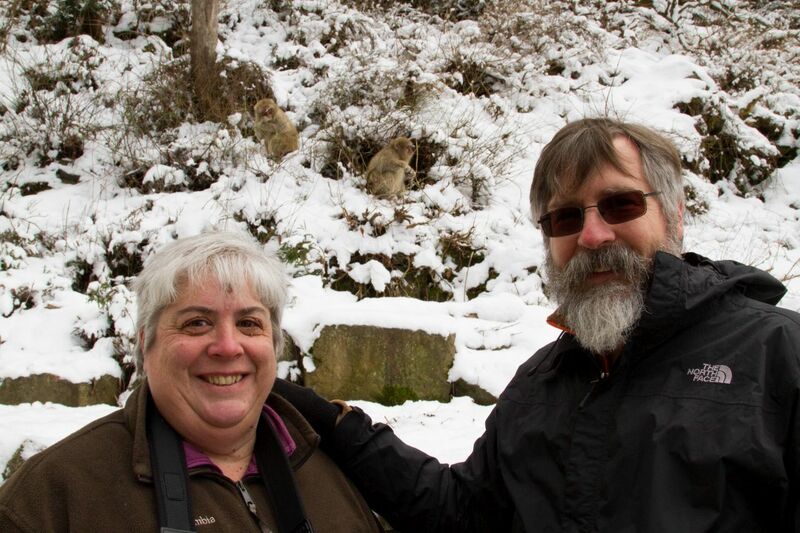 Jim and I have been to see the snow monkeys in Jigokudani twice. The first time was many years ago, and we stayed the entire weekend since there is a traditional Japanese ryokan within feet of the park entrance. Ryokans are one of those things that everyone visiting Japan should do once. It’s on the pricier side of accommodations, but even if you are a budget traveler it’s worth the splurge. Spending the night and eating dinner in a traditional Japanese inn really provides insight into the culture. The great thing about staying at the Korakukan is the proximity to the monkeys. 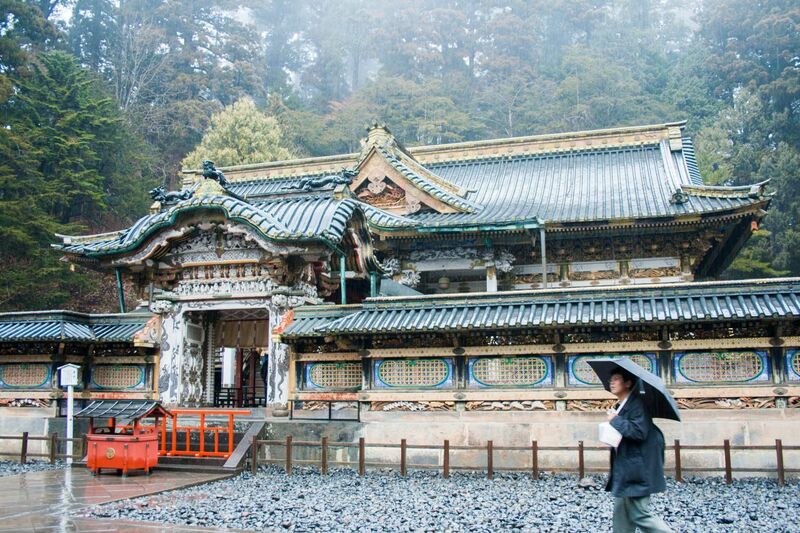 Since the monkeys live right there, some even sleep on the walls and roof of the ryokan. When we were there, we heard them all night, and we looked out of our frosty window at them and when my friend and I went into the ryokan’s onsen (hot tub) one jumped in next to us. It was thrilling to be sharing the bath with a wild monkey, but we didn’t stay in long after that. 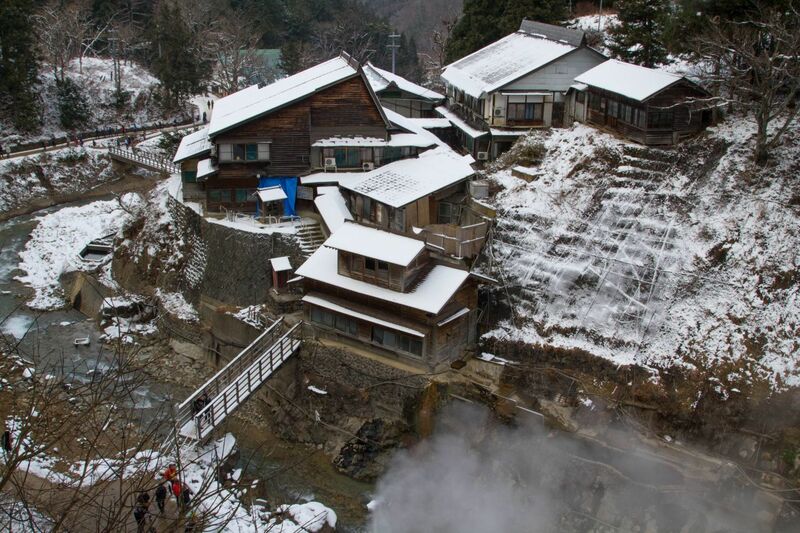 Jigokudani Onsen is the official inn of the Snow Monkey Park and a unique place to stay. 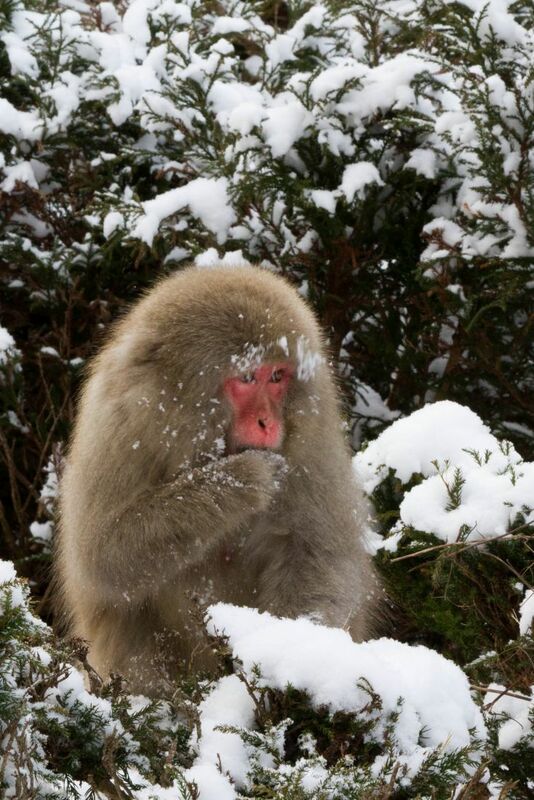 The snow monkeys are Japanese Macaque and specially adapted to living in the snow. You definitely do not have to spend the night right there with the monkeys, though, you can easily visit them in one day, in fact in just a few hours. 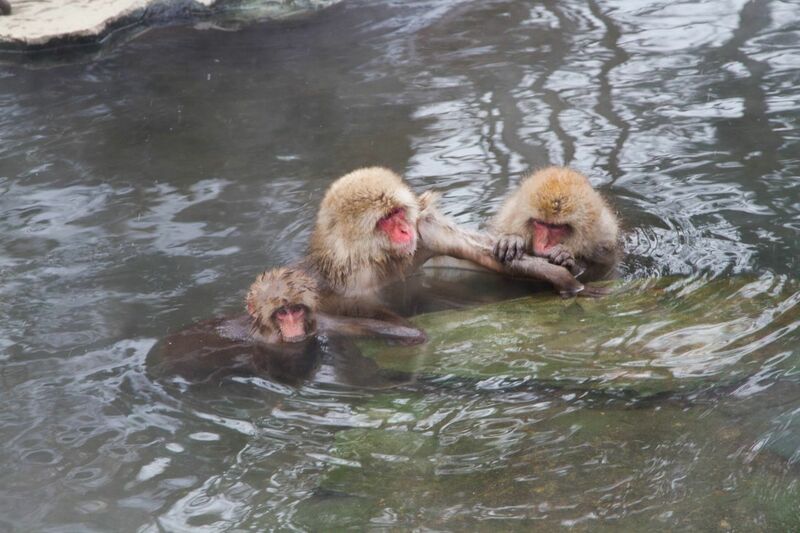 After a short walk into the park, you pay your fee, and there is one pool where the monkeys congregate, partly because that’s where the hot tub is, and partly because the park rangers feed them there. There’s not much else to do but watch them and take photos, so a couple of hours is really plenty of time. You’ll find the entrance gate at the end of the trail. You can also get a small snack and some souvenirs here. 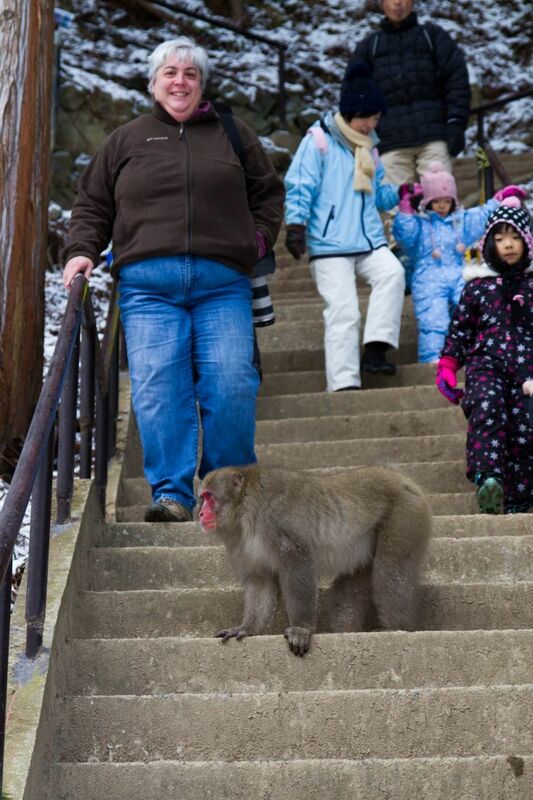 Snow monkeys aren’t shy or dangerous. They are very used to humans. Jigokudani is not a zoo. The monkeys live in the valley in one large group, about 140 of them. Since you must walk into the park, you will often see them on or near the path. Once you are inside the park, it’s a short walk across a bridge to see the hot tub. 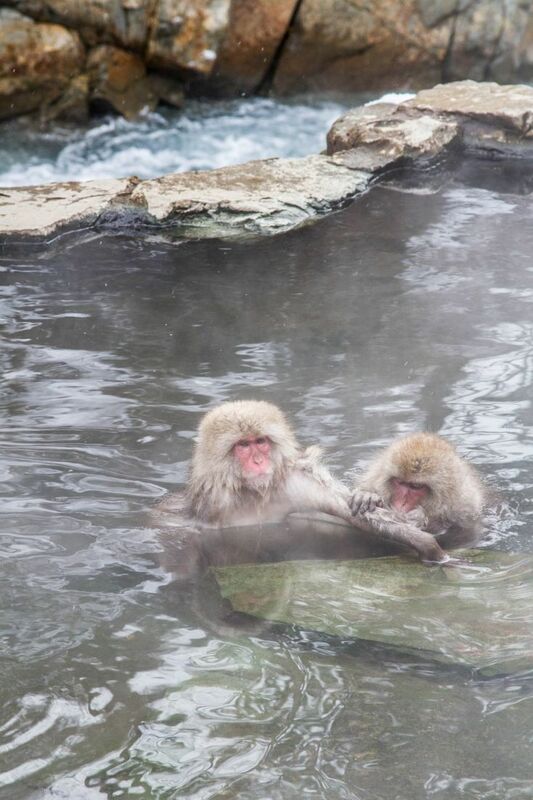 It’s pretty amazing to see the monkeys with their eyes half closed, relaxing in the spa. Some will jump in and out, especially the younger ones, and some will be grooming, but mostly they are just keeping warm and half asleep if they are in the water. Don’t you just want to climb right in with her? Look at that soft, elegant fur. Obviously the hot soaks are good for the hair-do! There is usually no more than maybe six in the water at one time, and of course the older or more important monkeys have first choice. That means that there are plenty of monkeys just hanging around on the brush, the rocks, and right in the middle of all the people loaded down with their cameras. They will even run through your legs if your aren’t careful. It is really entertaining to watch. This is a very popular attraction. Bring your hats, gloves, jackets, and cameras. 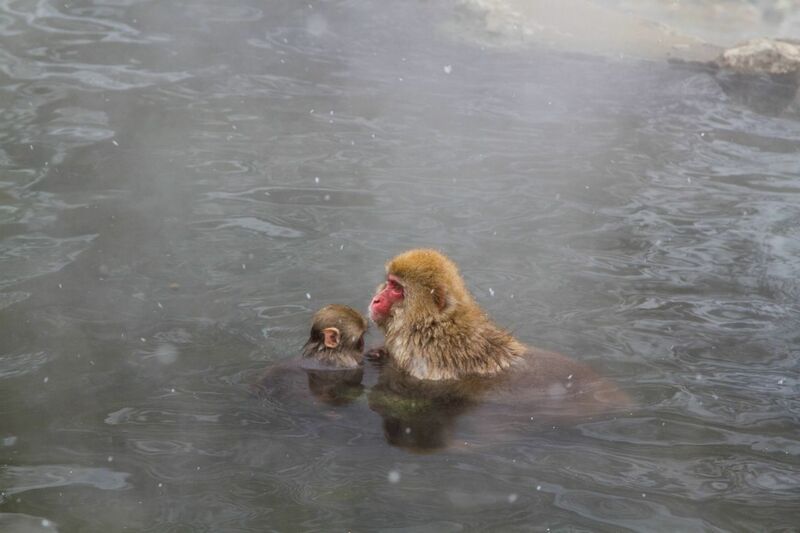 Mother and child snow monkeys enjoying the peaceful hot bath. Even though I’ve been twice, I would definitely go again. It’s just fun! The park is open all year long, 365 days from at least 9:00 – 4:00 and longer in summer, but by far the best time to go is in the winter. The monkeys aren’t as interested in hot tubbing in the warmer temperatures and it’s not as pretty. Cost of entry is 800 Yen. 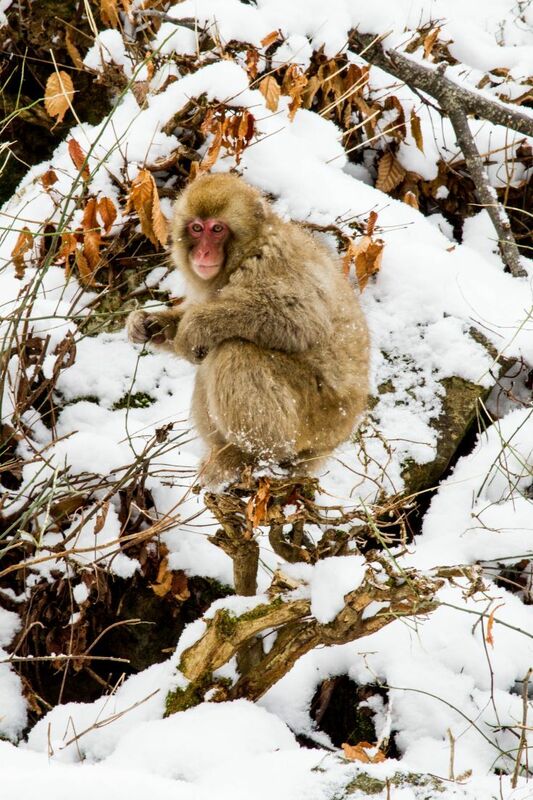 A visit to the Snow Monkey Park is sure to bring a smile! By train from Tokyo: Unfortunately it is not that easy from Tokyo, and pretty expensive (at least the equivalent of $100) but if you buy the Japanese Rail Pass it will be much cheaper for you and it’s in a very central location with plenty of places to go all around. 1. Take the Hokuriku Shinkansen (bullet train) from Tokyo main station to Nagano. 2. From Nagano take the local train Nagano-sen to Yudanaka Station. 3. Take bus the Kanbayashi trail. This is the route we took the first time we went and it’s pretty straightforward. 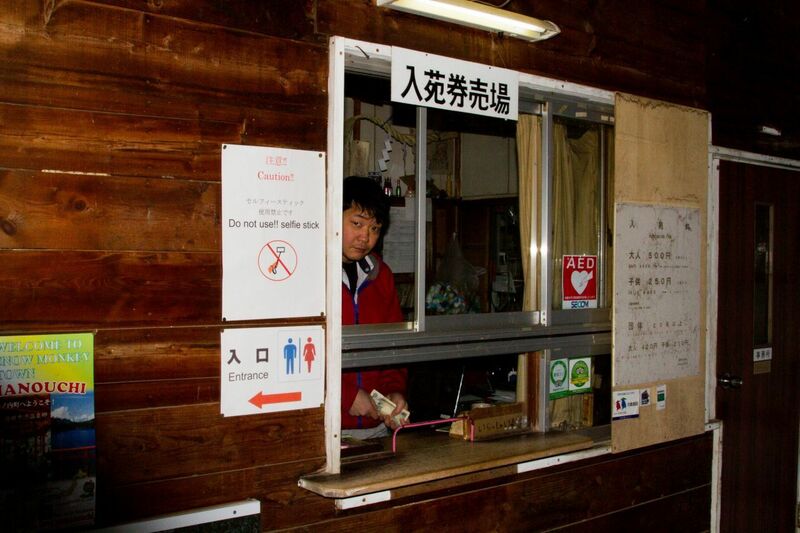 The bus driver knows that you are going to see snow monkeys and will help you. Don’t worry. By bus: There is a ski bus that runs during the winter months called the Express Bus to Kanbayashi. It leaves from the Nagano Station (East exit) numerous times per day and the end point is the skiing resort of Shiga Kogen, but it will stop at the Kanbayashi Trail as well. 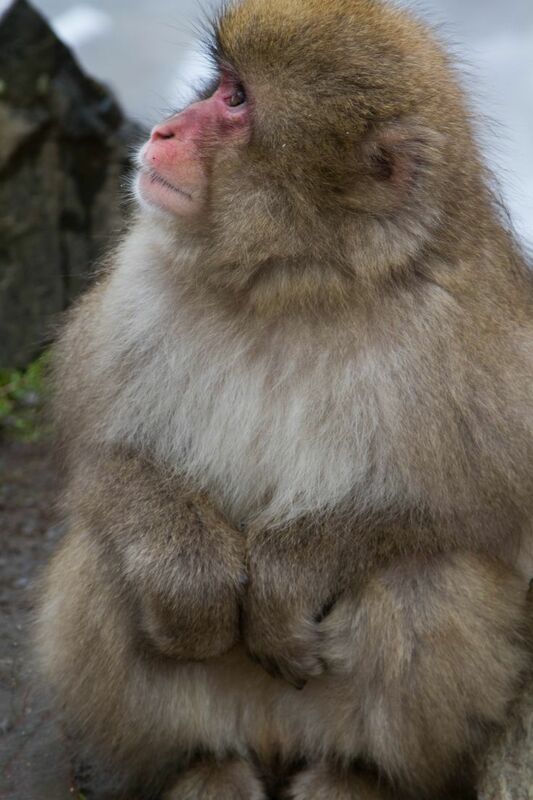 Or there is a Holiday Shuttle Bus that runs from the Yudanaka station and will drop you off at the entrance to the monkey park – Jigokudani Parking Lot. It only runs on weekends and Japanese holidays from December through March, and try to make reservations. By Car: We drove this past time, because we were traveling with five people and it was much cheaper than taking the train. Driving in Japan is pretty easy, but they do drive on the left. At least all signage has both Japanese and Western writing, so you can easily follow them. Take the Joshinentsu Expressway (toll road) and at the Shinshu- Nagano interchange take route 292 to Shiga Kogen. You must park and walk in. We had to park down the road quite a bit and we arrived at 9:00, so either spend the night somewhere near or get a very early start. There is a lot of walking. Sturdy shoes should be worn during all seasons. Winter is cold, so layer up and wear heavy socks, gloves, etc. If you bring children, either make sure they are good at walking or wear them in a backpack. It’s really not stroller friendly. There is really nowhere to eat at the park, other than a small sales on drinks and snacks. Plan to eat lunch in Yudanaka. It’s a great little city with some cute restaurants. Rhonda, I think they are very spoiled monkeys, a life of spas and waiters bringing them food. Who wouldn’t love it? Awesome post. 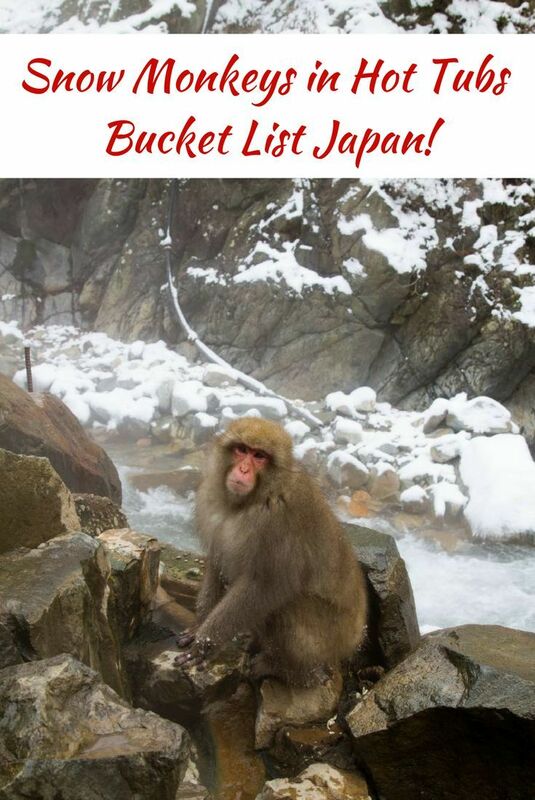 Snow Monkeys in Japan are super high on my bucket list. Stephen, Go in the winter! You will love it. so luck you got to go in the winter! 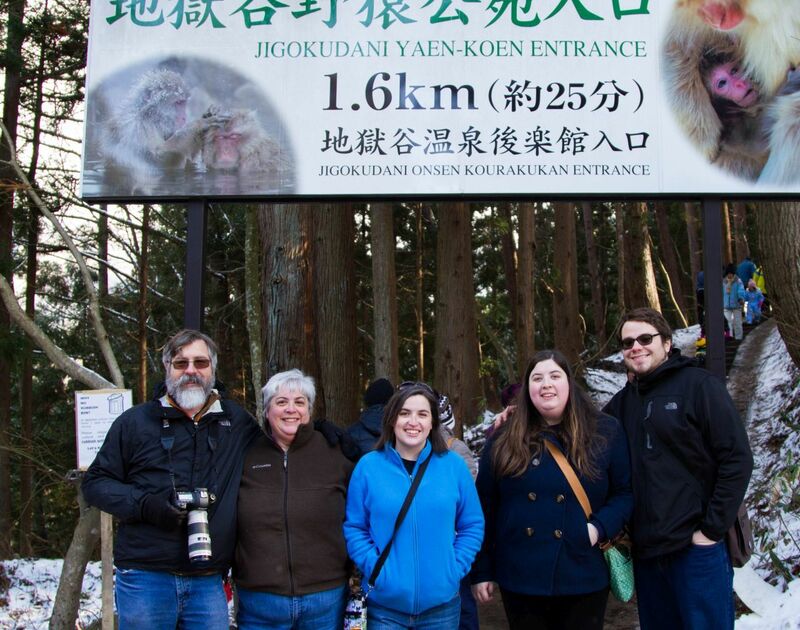 We visited the snow monkeys in the spring and while it was the most amazing experience ever, I have been dying to visit again during the winter. I literally took like 600 photos during our time there! Karilyn, I do think it’s better in winter, because it’s surrounded by beauty. 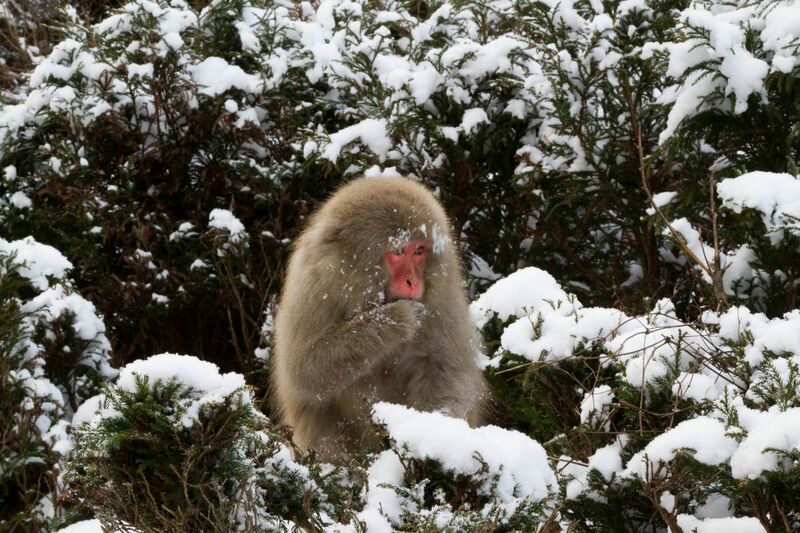 I love the snow monkeys.